From a design perspective, the look of polished concrete floors and open ceilings is a highly desirable, contemporary aesthetic for commercial spaces. As a major trend sweeping across retail, industrial and other markets, architects and designers are finding that this unique surface has significant environmental, safety, sustainability and maintenance benefits as well. From helping to earn U.S. Green Building Council (USGBC) LEED® credits to providing performance benefits, polished concrete is fast becoming an attractive alternative to carpet, VCT and vinyl flooring. But that doesn’t mean it doesn’t come with its own set of challenging installation requirements. While new flooring options like LVT have seen explosive sales growth, gaining significant media attention in recent years, this seemingly simple alternative to traditional floorcovering products has slowly but surely cemented its place in the industry due to a specific combination of attributes. As a result, numerous large retailers such as Wal-Mart, Albertsons and Safeway have moved to polished concrete as the standard flooring material for both their new and existing stores. The same rings true for smaller boutique stores, office buildings, institutional facilities and more. But why? Polished concrete flooring solutions are growing in popularity across market categories. It’s an appealing option, but comes with its own unique challenges. Recognizing the complexities and wanting to meet demand, INSTALL expanded its training program and curriculum to provide trusted installations and mitigate potential flooring failure. From an aesthetic standpoint, polished concrete offers a modern and sophisticated look. A number of stains, colors and topping materials can be added to the floor, along with inset logos and etching. The result is an installation with a varied, natural look that is highly light reflective, slip resistant and visually impactful. The thermal properties of concrete also help reduce heating and cooling loads for buildings. This translates to significant energy savings when spread across hundreds of thousands of square feet in warehouse stores and large commercial spaces. For large chains and companies like Amazon that operate massive fulfillment centers around the country, this is a serious consideration. Since concrete is already used as a subfloor in most new buildings, polishing it cuts back on material usage and waste. This adds to LEED credits as there are no additional flooring manufacturing enlarging our carbon footprint. Similarly, since polished concrete is reflective, it helps architects and designers earn electric credits. And because there is limited maintenance and no replacement materials, polished concrete flooring also lessens water use and construction waste. Altogether, polished concrete flooring can contribute to nearly 40 different LEED point categories. These include points for materials and reuse, indoor environmental air quality along with energy and atmosphere. Beyond achieving LEED points, the other reason facility managers, interior architects and designers are gravitating towards polished concrete is maintenance and cost-savings. Contractors and installers can also apply the same skills to pourable self leveling flooring. Most manufacturers include a wear layer on the top of products so installers can use the same tools and finishing process as concrete. However, unlike concrete, self-leveling material have a uniform and almost perfect consistency. Plus, designers can incorporate pieces of copper, glass or other aggregates to create a custom look. When polished, the flooring will take on the look of the aggregate material. With all of these benefits, why don’t more contractors offer polished concrete in their roster of services? The main reason comes down to challenging installation requirements. Thankfully, there are organizations in the industry that are working to address this. While polishing concrete looks like an easy task, organizations like INSTALL, the International Standards and Training Alliance, have recognized its complexities and are working to produce dedicated training. The new curriculum and training addresses poor surface conditions regarding existing flooring, including cracks, spalling, pitting and leveling. It also incorporates polished overlays, which offer distinct qualities that can’t be achieved by polishing existing concrete. This includes the ability to create a white polished concrete floor, a very uniform and predictable finish, and an even distribution of exposed aggregate. “When installed correctly, polished concrete is easy to maintain, cost effective and environmentally friendly,” said Tod Sandy, coordinator of the Detroit Carpentry Apprentice School. “As a result, more and more end users are requesting it. By committing to ongoing training, we are better able to adapt to changes in the market so that our mechanics meet the demands of the industry. 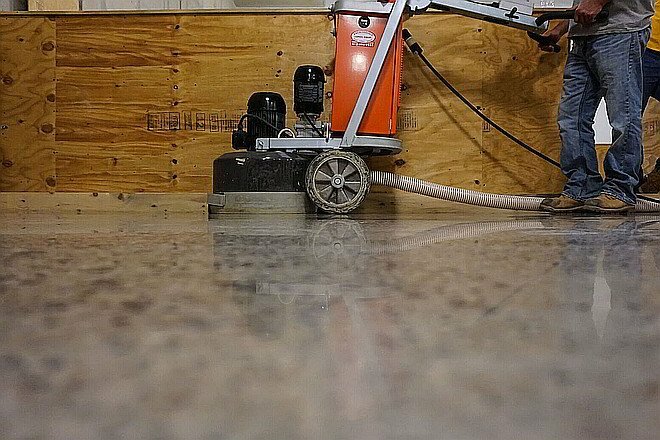 With an increased focus on training and new advances in product and installation technology, polished concrete flooring will continue to grow and evolve in the coming years. This unique alternative to traditional floorcovering materials provides interior architects, designers and building owners with multiple benefits. Not only does it contribute to nearly 40 different USGBC LEED point categories and higher slip resistance, it provides significantly reduced maintenance costs along with a unique and design-forward aesthetic. It’s an exciting future for flooring’s newest trend.